Bear Confusion Syndrome is a human experience. It happens during the transition from winter to spring. This strange phenomenon occurs with many people – and this year with many more. This year the relentless winter of snow and cold and more snow enveloped much more of the country. This syndrome is not unusual for those of us at the northern latitudes, such as where I live in the Adirondack Mountains. But this year Mother Nature decided to share the joy. As a result this year bear confusion syndrome is and will be more wide spread. Usually Bear Confusion Syndrome is a brief but powerful state of mind. One day in early spring awareness changes and everything feels different. This can be a disconcerting moment of confusion right before the transition to feeling more alive, more inspired, more optimistic, more driven, and oh yes-more positive! I’ve heard comments like this, ‘Who was I so wrapped in gloom, moving in slow motion, and grumpily responding to everything in my life? I am not that person now, what happened?’ Or simply a mournful wale, ‘Oh my God will winter ever end?’ Yep, a bout of Bear Confusion Syndrome I suspect. While this not a bona fide clinical condition, I have observed the symptoms frequently in April here in very northern New York State. Go a little south and it is more likely to hit in March. The confusion includes disorientation as one looks back at the winter wondering where you have been and how you got here. Indeed it is looking back and wondering just who that was during the cold, dark, snowy season who didn’t feel like doing anything, gained weight, felt depressed, worried pointlessly and just struggled through the days. Confusion? Yes, and it can come in a variety of forms. But ultimately it is confusion of the most positive sort. It can be the kind of confusion that comes right before the emerging clarity and resolution you have when you leave a rough period behind. It may also be the confusion preceding the actual of arrival of nicer days in the foreseeable future! For some the confusion occurs in that moment when we realize how the cycles of nature can still effect us, no matter how evolved we (humans) feel we have become. No matter how disconnected from nature you are, it has made its presence known and affected your state of mind for months. Or perhaps that conclusion is an insight that occurs when the confusion subsides. It makes me wonder if some of us have an inner bear that hibernates during the winter months. No we don’t crawl into a cave and sleep, at least not literally. But it is like some part of many of us does hibernate. When spring arrives we have to get reacquainted with ourselves when we wake up. I ask myself, does a real bear have that problem? Probably not. To the bear it is just an abnormally long nap from which he awakens to get on with his day. 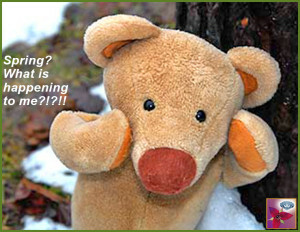 Bear Confusion Syndrome is a wholly human experience. Fortunately, the confusion passes quickly, and the goals and plans that are in front of us feel possible again. Sometimes the confusion comes and goes for awhile before it fully resolves. It just feeds the confusion on those spring days when it snows again. The oscillating expectations take their toll too. “It is spring! Nope I’m freezing again. Its spring! Nope it is snowing again. Its spring! Nope. What the f***, will this ever end?” Eventually winter finally calls it a season and spring is really here. The winter state of mind is like a trance, or an altered state. The truer this is for you, the more profound the emergence when spring actually arrives. The brief experience of Bear Confusion Syndrome is well worth the realignment that is happening at the level of mind and spirit! An earlier version of this article was originally published on this blog in April 2009. This entry was posted in Community, Mind, Musings, News and tagged change, self-discovery, transformation, transitions. Bookmark the permalink.